Should I Fill Cracks in Window Frame? This week’s Ask The Craftsman question comes from Desley. Desley, first let’s be sure what you are looking at is something that actually needs to be repaired. 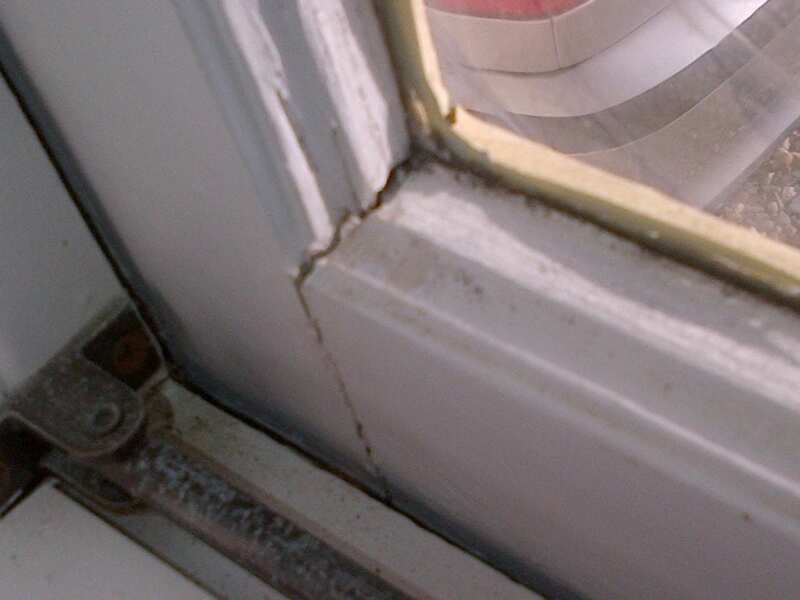 It’s a little difficult to tell from your picture, but cracks in window frames may be something you should leave alone. Let me explain. A window sash consists of two stiles (vertical pieces of wood) and two rails (the horizontal pieces). These are joined together with fairly complex mortise and tenon joints and these joints make the frame very strong. The strength of these joints is also found in the fact that they can move with seasonal changes as the wood expands and contracts. In colder weather, the wood fibers contract and joints have tendency to open up. Then in the summer as humidity and heat increases, the wood swells and the joints tighten up again. If you fill those joints when they are contracted, then when the wood expands again it will either push the filler out of the joint or cause the wood to bow due to the pressure. There are two guideline’s to use when determining to fill or not. Can you see light thru the crack? Is the crack large enough to fit a quarter in? If the your window meets one or both of these, then I would go ahead and fill the cracks with some Abatron WoodEpox. You can read more on how to do that here. If it doesn’t meet those criteria, then I would make sure any exposed wood inside the crack has been primed and painted to protect it from the elements and leave it be. Hello, my developer carried work on our windows I. Order to renew their look put new locks in, however the windows panel cracked, now they want to fix it by applying a glue . Is that the right things to do?top frame is cracked a long the place when they put new locks in. Please advice what we should do? Thanks for sharing this advice on repairing cracked window frames. I agree that it is important to know whether to fill cracks, especially if you have more expensive frames. However, if the crack is too noticeable, even with the crack filled, you might want to consider getting a new window. You don’t want to accidentally let bugs into your home!